Superyacht Australia represents businesses targeting the global Superyacht Sector, promoting Australia as a cruising destination for the global superyacht fleet plus the capability of the Australian Industry to service this fleet. Australia is renowned for its iconic attractions, pristine, safe secluded cruising grounds and its award-winning repair and refit businesses, marina facilities and established supply chain. In a sentence, Australia has it all and a warm welcome awaits you! Superyacht Australia produces the SUPERYACHT AUSTRALIA MAGAZINE annually. The magazine is distributed globally and available at major marine boat shows. Copies are sent to international media and superyacht industry networks around the world. This is a high quality publication featuring stories that provide up to date information about the facilities, unique cruising grounds, and product and service providers ready to engage with visiting superyachts. 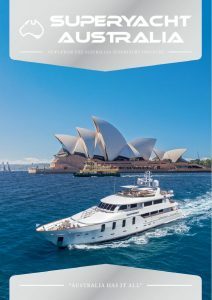 The Superyacht Australia magazine was developed to communicate the activity within the Australian superyacht sector globally and provide key industry stakeholders, captains, and owners with up to date information. Now up to its sixth annual publication release, it is launched annually at the Monaco Yacht Show.